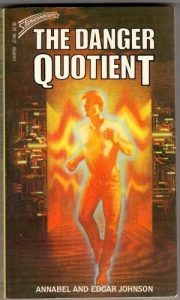 Annabel and Edgar Johnson’s 1984 The Danger Quotient is a standalone time travel novel. 130 years after World War III turned the surface of the Earth into a lifeless, UV-soaked hellscape, things are not going well for the descendants who took refuge in a vast network of tunnels under Colorado. For reasons unexplained, lifespans keep dropping. K/C — 4(SCI) (or Casey, for short) is a gene-engineered genius, one whom his designers hope will be smart enough to solve the problem of the shrinking lifespans. Too bad that he probably won’t live long enough. He suffers from congenital defects that will kill him all too soon. He has a cunning plan to put the little time remaining to him to good use. It’s a plan dependent on his homemade time-machine.